In Music We Trust - Mahavatar: Go With The No! Female-fronted melodic metal with a worldly flare, the Jamaica meets Israel by way of NYC duo known as Mahavatar will turn some heads, and not only because they happen to be attractive. The duo (rounded out by session musicians) have churned out eight intriguing hard rock tunes with hints of Gothic rock and shades of underground metal (especially in the singing, which switches gears from clean to mean quite well on tracks like "Raw"). Walking the line between dirge-esque Sabbath melodies on "Psychos" and the well-orchestrated pseudo power metal documented on "Open Your Minds", Go With The No! showcases a female-based act whose bark and bite standout head and shoulders above anyone's preconceived notions of what the usual chicks with guitars group sounds like. 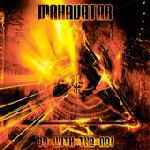 Succinct and solid, Mahavatar have provided a well- rounded release that heavy rock fans should enjoy.